Looking for good schools, good health, good morals, and good times? Well, then you'd need to find good roads first, according to the National Highway Association. Which is why the NHA drew up the first proposed highway plan in 1913. To propose the building of fifty thousand miles of National Highways may seem to the unthinking a revolutionary idea, yet fifty thousand miles of Highway is but little more than two per cent of the total road mileage of this country... These highways have not been merely drawn upon a map with a pencil in the hands of a theorist who decided "it would be a good thing to have a road here!" They have been accurately and carefully located by trained and experienced road engineers, working with a large and complete office and drafting force for more than four months. This system was to be composed of six main national highways, 13 trunk national highways, and 40 link highways. The link highways, the NHA explained, would connect "the Mains and Trunks" and reach out "in all directions until the country as a whole is covered with almost a spider-web tracery of highways." ...Besides issuing brochures and circulars aimed at convincing citizens of the need for a national road system, the NHA was a prolific producer of maps. Cartographic work was done at an office in South Yarmouth, Massachusetts, where approximately 40 people were employed on [Davis' property]. Davis believed that these maps would be helpful to a national highways commission that he hoped would be established and that they would assist the states in integrating their roads into a national system. The National Highways Association believes that, when established, these national highways will increase the wealth, the power, and the importance of this country as nothing else can do besides that which has brought civilization to the savage, wealth to the poor, and happiness to all—GOOD ROADS. An inset from the above NHA map equating good roads with good everything. 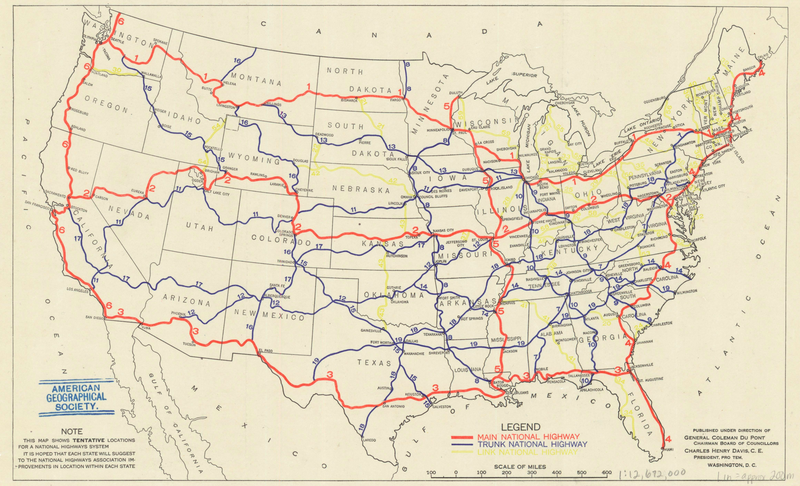 An NHA map associating good, transcontinental roads with wartime preparedness. Another NHA map correlating a national highway system with wartime preparedness. This particular map contrasts the benefits of a highway network with those of the Panama Canal, which had opened a year earlier. The map claims – "on what basis is unclear," notes the WDL –that good roads everywhere would come at a cost comparable to that of the canal.